Looking for a quick, easy and ADORABLE touch to your St. Patrick’s Day decor? This darling free printable St. Patrick’s Day banner is just what you need! It’s a snap to put together and will be the perfect touch to your St. Patrick’s Day decorations! I was definitely was looking for something like that for my kitchen table centerpiece. 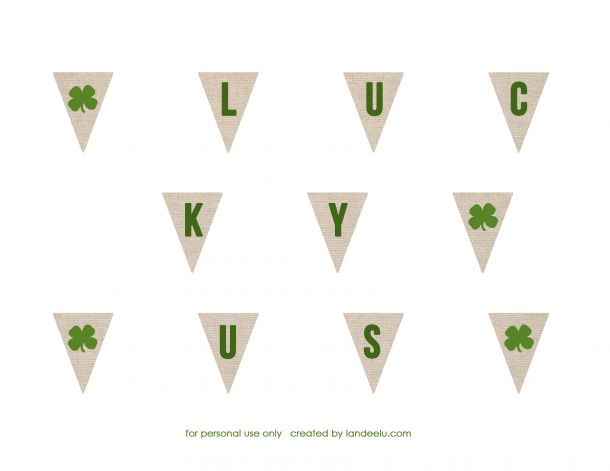 I had some cute Ikea greenery and pots and wanted to add a little LUCKY decor so I came up with this printable Mini St. Patrick’s Day Banner. You can make one too in about, oh I’d say, 10 minutes? Download St. Patrick’s Day banner printable >>>>>>> HERE <<<<<<<< and print. Cut out individual bunting triangles with scissors. Use mini-hole punch to punch holes in corners of each triangle (you can also glue bunting to string). String it up! I chose to do mine in two separate pieces but you could also do LUCKY US all on one string with one of the shamrocks in the middle or any other configuration you can think of! String between two pieces of wire (as I did), hang on one corner of a mirror or across a picture frame of your family picture, use as a cake topper…. whatever your imagination can dream up! I am loving it as my centerpiece on my kitchen table! I love the whole look of this from the bunting to the plants and the containers. It’s 2:35 am so plz firgive me if I missed it, what kind of plant is it ? It’s so adorable how it grows but I don’t recognize it. And the white containers whit the lacy top part, did you make them or buy them ? It really is so elegant. They are faux plants and they are from IKEA as well as the white containers! Very inexpensive and cute! Where did you get the wire holders? Did you make them or buy them? Love the idea! I made them out of a thick wire! Super easy!